$100 - $200 off Z22 models. Don't risk your liquor or tobacco license by mistakenly serving a minor or undercover law enforcement agent. An ID Scanner from TokenWorks?/font> Inc. automates and documents the Age Verification process for nightclubs, bars, casinos, liquor stores, convenience stores, Supermarkets, etc. 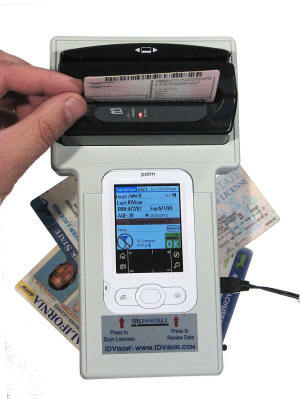 The IDVisor?/font> line of ID Scanners with CardVisor?/font> Age Verification software alarms if an ID is underage or expired and helps identify fake IDs by cross checking the displayed name with that printed on the ID. It records transactions so you can prove a specific ID was checked at a specific time which is vital when establishing an affirmative defense with state authorities. Pays for itself by preventing one infraction, typically $1500 in fines, legal fees and lost time (first offense). On the third offense, most states will revoke a liquor license, effectively putting the company out of business! Don't wait for an infraction to make this investment, take action today and protect your business, employees and patrons. 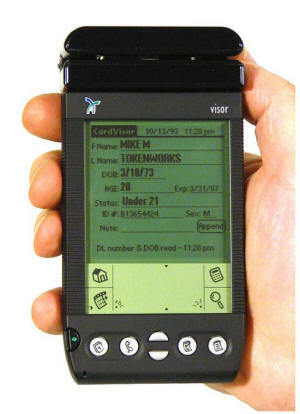 All our ID Scanner products have had unlimited software updates since first introduced in 2001. Just visit the support section to download new versions of software. Brick and Mortar Business - TokenWorks is a C corporation, operating out of commercial office space and have been in business for over 10 years. Our products are engineered, designed and assembled in America. We are the manufacturer and provide factory direct pricing with our Satisfaction Guarantee. If you have questions, don't hesitate to call us toll free at 1-800-574-5034. 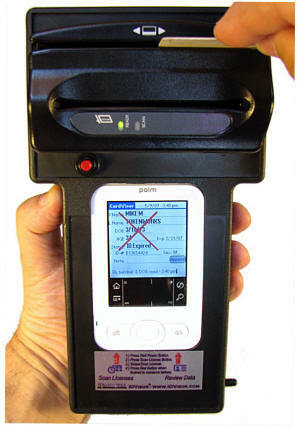 Click Here to learn more or place order Click image to see Z22 ID Scanner in use. All IDVisor?/font> ID Scanner packages store key transaction data which is vital when proving that an ID was checked. Also included is hardware and software to download this transaction data to a PC for secure archiving or creating a mailing list. Don't pay hundreds of dollars more for the ability to download name/address transaction data!